Vatican News report: A Swiss guard and his Brazilian wife-to-be were taken aback to see Pope Francis appearing unannounced in the church to bless their wedding. 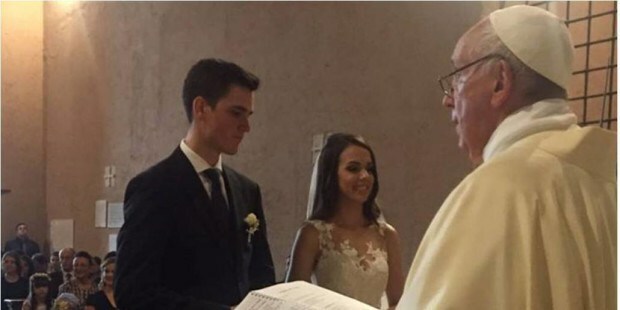 Pope Francis on Saturday surprised a Swiss guard and his would-be Brazilian wife, by appearing un-announced in the sacristy just ahead of the wedding ceremony and decided to marry them. Neither the couple nor the few attending the ceremony knew about the Pope’s surprise move, said Brazilian priest Father Renato dos Santos, one of those present. The priest entered the sacristy of the Church St Stephen of the Abyssinians in Vatican City, to prepare for the celebration when he was taken aback by a smiling pope seated there waiting for him. The Holy Father took charge and went ahead. The Holy Father’s homily was on three verbs: "to begin", "to stop", "to resume the journey" – which he explained are needed to be able to live their marriage in fullness. “The Pope showed how dear to his heart marriage is,” Fr. dos Santos pointed out. “The Pope has great love for this sacrament which helps start a family and which wants to put God at the centre," Fr. dos Santo added.